Just as we were passing through Doncaster, Jo’s phone began to vibrate. “Oh no, it’s the child minder. Something terrible has happened” she winced. As she read the text on her mobile, the panic in her eyes dissolved. “She’s on the Metro and she loves it”. The Metro? We both felt more than a tinge of jealousy. We’d never taken Izzy on a train, and here we were, speeding at 108 miles an hour (the East Coast internet tells you precisely how fast you’re travelling) to spend our first weekend without her in London. In truth, we’d rather have been with her on the Metro. Apparently she was loving the experience so much she steadfastly refused to get off at Haymarket and would have happily spent the whole afternoon going round the big circle to Tynemouth and back, loudly singing The Wheels on the Train Go Round and Round to all the passengers. The purpose of our trip was a carol service at my youngest son’s school, but, thanks to East Coast’s amazing new frequent traveller scheme, our first class train tickets were absolutely free, so we decided to celebrate by making a weekend of it. However, as anyone with a wife (or, in my case, several ex-wives) will know, this is a false economy. There is no such thing as a free weekend in London, particularly a fortnight before Christmas, with the stores offering 50% discounts in a desperate attempt to drum up custom. Shops were offering customers free mugs of hot chocolate with marshmallows and the streets were full of brass bands and Frank Sinatra lookalikes crooning White Christmas. I’d have quite happily spent a day wandering around looking at the Christmas lights and eating free mince pies – not so a credit-card bearing wife. That’s why I had rather sneakily booked an afternoon train: it severely restricts the spending hours. I’d forgotten about late night closing. Our train had reached Peterborough by the time another text told us Izzy had been persuaded to leave the Metro for Fenwicks’ Toy Department. I groaned: we’d already bought her Christmas presents – what if she latches onto some new doll? We needn’t have worried: Michelle is the best surrogate mum any child could have: our daughter was firmly under control. By the time we reached King’s Cross, they had watched Fenwicks animated window display 14 times. Now they were off to see Father Christmas. We did the same. Actually, you couldn’t avoid him. 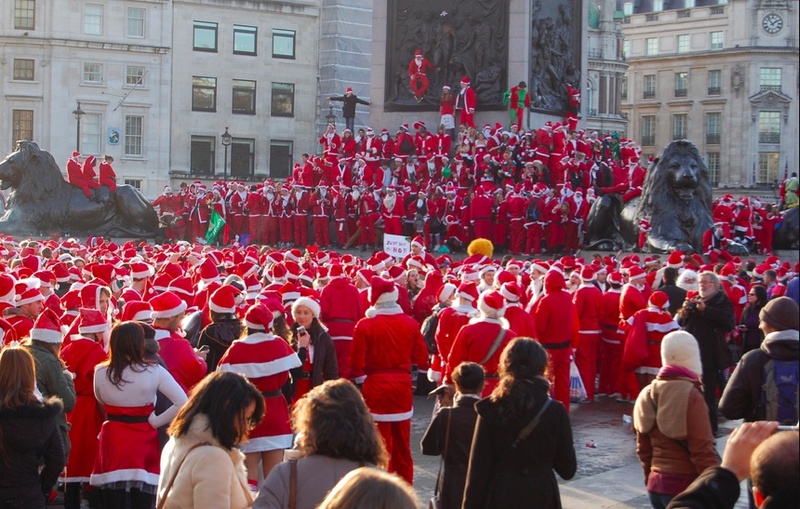 As we arrived at Oxford Circus, we walked straight into an army of Santas. More than a thousand of them had assembled in the centre of town, all determined to get blind drunk. Santacon is an annual flash mob in Central London. They assemble at a secret destination that’s only advertised on the internet the afternoon before (in this case a pub at Victoria Station: sleigh parking free), and head to the centre of town singing carols and smiling at everyone. It’s really an extended pub crawl and the only rules are that you have to dress as Santa (apart from those who come as reindeer) and you mustn’t scare the tourists. A group of girls had come as lingerie Santas, shivering rather miserably in their bodices. By mid-afternoon the sea of red, bearded drunks had vacated Trafalgar Square, where they’d been handing out Brussels sprouts to the Japanese, and congregated around Jo and me. We were glad Izzy wasn’t with us: it had been hard enough trying to explain how Santa was going to get his fat tummy (“Just like Daddy’s,” Izzy had said disloyally) down the blocked off chimney in her bedroom, let alone justify a thousand of them, clutching pints of beer and singing strange new words to her beloved Jingle Bells. Later on our taxi passed another assembly: scores of riot and mounted police were lined up, waiting to clear the streets of Christmas spirit. A final text arrived: Izzy was fast asleep, dreaming of Santa Claus. If only she could see him now.